The Nelson Monument at Exchange Flags, image by Mary Battle, Liverpool, England, 2014. In the eighteenth century, merchants conducted cotton trading outdoors behind the Liverpool Town Hall in an area called Exchange Flags. Liverpool’s first Cotton Exchange Building was built in 1808, adjacent to Exchange Flags. 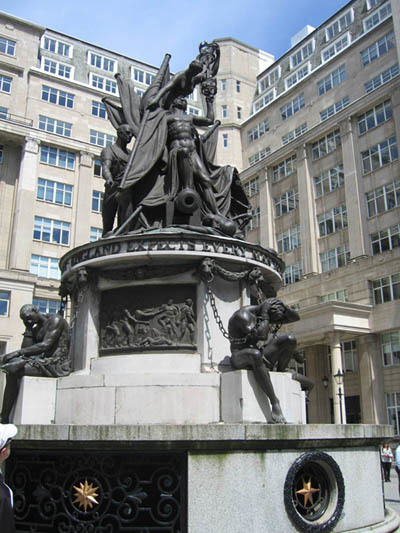 In 1813, this statue was erected at this site to honor Admiral Lord Horatio Nelson and his military victories. The figures in chains at the base represent French prisoners, but author Herman Melville, who worked in Liverpool in the 1830s, later wrote he believed they represented the slaves of Virginia and Carolina. While the Liverpool docks managed to sustain business during the 1860s, many cotton brokers actually profited from the Civil War. At that time, there were two types of brokers in Liverpool. The first was the selling broker, who represented the importer. His job was to sell raw cotton to the spinners in the cotton districts around the city of Manchester for the highest price. The second was the buying broker, who represented the spinner. His job was to find, among all the cotton coming into Liverpool, the precise grade desired by his spinner for the lowest price. All the cotton that came into the port passed through selling and buying brokers. Sometimes they even worked for the same firm. At the start of the Civil War, there were about one hundred and forty cotton brokerages in Liverpool. This number increased with the opportunities offered by the war. Most of these brokerages were hereditary businesses established in the late eighteenth and early nineteenth centuries. Brokers had complete control over who could join their ranks, and importers seldom changed their selling agent, or spinners their buying agent. There was no price competition between them, since commission was fixed at 0.5% for each exchange. The brokers took few financial risks (unless they chose to), since they seldom owned the cotton. During the war, the quantity of raw cotton coming into Liverpool plummeted, which meant that prices soared. At its lowest, the annual volume of cotton dropped by seventy percent. Prices, at their highest, became five times higher than their pre-war norm. Throughout these fluctuations, Liverpool’s brokers not only continued to receive their one percent combined commission on this inflated value, they often received it several times over. Due to the escalation and the volatility of prices, much of the wartime cotton was bought and sold by speculators who gambled when the prices would rise or fall. Speculators then sold to other speculators. The same consignment of cotton could be bought and sold up to ten times before it reached the hands of a spinner. The brokers took multiple commissions and often made considerable profits through these speculator transactions. 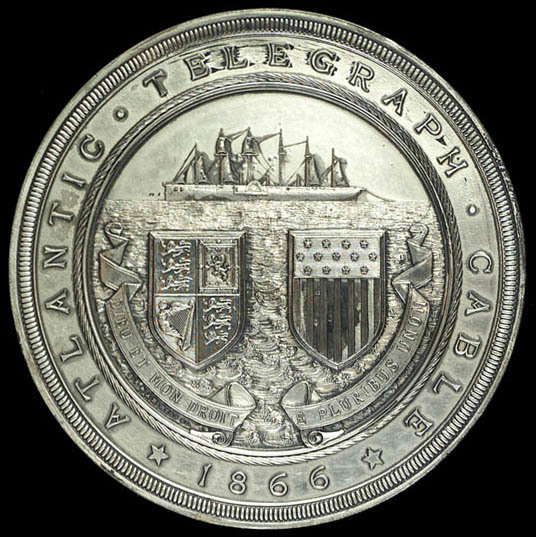 "Medal commemorating laying of the Atlantic cable, 1866," S.J. Wyon and Alfred Benjamin, 1866, courtesy of © National Maritime Museum, Greenwich, London. Telegraph cables accelerated futures trading and price hedging on the global cotton market, a lucrative business that began in Liverpool during the American Civil War. Wars often lead to unexpected innovations. The Civil War ultimately helped change the way that cotton was bought and sold globally. This transition became complete with the laying of the first successful trans-Atlantic telegraph cable in 1866, reducing communication time between traders from two weeks to two minutes. The war years themselves also saw a substantial development of futures trading and price hedging, beginning with the cotton trade. People with no connection to cotton were caught up in the speculative process, prompting one visitor to the Liverpool Exchange to observe that the brokers are "busy selling what they have not got to people who don't want it." Many speculators, brokers, and traders, gained spectacular fortunes from the Liverpool cotton trade during the Civil War, though many lost fortunes as well.